PlotLab .NET is a set of .NET 2.0-4.5 components for very easy and fast Data Visualization. 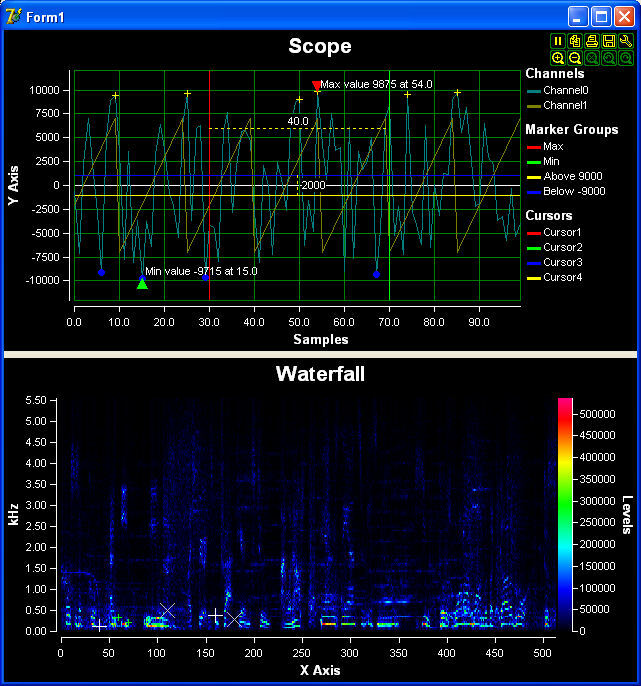 - Waterfall Component - a single channel waterfall data plotting component. Especially suitable for FFT, and spectrum results. - Multichannel Waterfall Component - a multichannel waterfall data plotting component. Especially suitable for video histogram representation. - Panning and Zooming - Zoom in out, Pan and navigate. - Zoom/Pan history - Undo and Redo zooms/panning. - Data gaps - allows gaps in the data channels. - Markers - Add data markers. - Cursors, measurement and selections - Add data cursors, measurement lines and selections. - Multi axes support - Supports Multiple X, and Y axes. - Downsampling - Automatically reduces displayed samples to improve performance. - Zones - Allows arbitrary and elliptic zones. - Save to file - Save to bitmap or JPEG file. - Print - integrated printing support. - Highlighting - Highlight channels, cursors, markers, and measurement lines. - Build-in Dialog - Configure the components from the build in dialog. All of the components are optimized for very fast data plotting, and support multithreading.